This week Sarah needed to go into London (she reckons she was meeting Guy Kawasaki) so I thought I’d pop her in the van and show her what a furniture delivery entails. 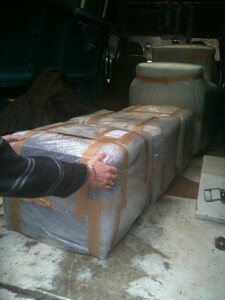 Loading safely, ensuring that the straps are there to secure the items, sack trolley on hand to move it into position on the van. As you can see the furniture is wrapped securely for “just in case”. The items are packed safely so if another vehicle hits us, or we have to swerve to avoid something the furniture is kept in pristine condition. Unloading at the end destination, after checking the packaging is intact (it is) and then I drop madam off at the tube station.